Since figs are in season just once a year, for a short period when summer fades into fall, this is the salad I’m devouring right now. The bitter radicchio paired with the sweet, caramelized, roasted figs and the salty crumbles of goat cheese satisfies every craving in one forkful. Figs are one of those rare fruits that producers haven’t yet figured out how to grow out of season, ship from halfway around the world, or pick under-ripe and store for months on end. Therefore the figs you’re seeing right now at your grocery store or farmers market are at peak perfection. Transform this salad into a nourishing meal, perfect for lunch or dinner, by tossing in a cup of cooked farro, wheat berries, or brown rice. When figs are not in season, pears or grapes make impressive stand-ins. In a medium bowl, toss together the figs, balsamic vinegar, honey, olive oil, and salt. Spread the figs out on the baking sheet and roast in the center of the oven for 10 minutes, or until soft and slightly browned. In a small mason jar, combine the balsamic vinegar, olive oil, and mustard. Screw on the lid and shake vigorously until fully blended. In a large salad bowl, toss together the arugula, radicchio, half of the cheese, and half of the nuts. 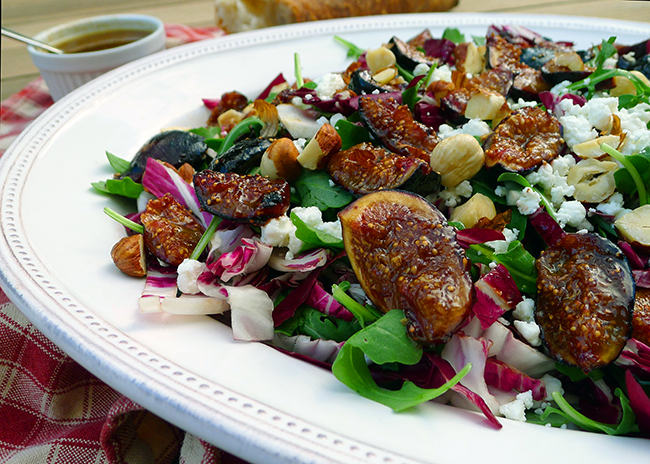 Top the salad with the roasted figs and the remaining cheese and nuts. Serve with a hunk of baguette and the dressing on the side for drizzling over top. Next Big life changes happening!